Vivillon (in Japanese: ビビヨン “Viviyon” ) is a dual-type BUG and FLYING type Pokémon. It is known as the “scale” Pokémon. It evolves from Spewpa starting at level 12. It is the final form of Scatterbug. I have caught and named several Vivillon. The one I caught and trained for my journey through Kalos was named “Flying V”. I named it after a 1967 Gibson “Flying V” guitar (I have had my eye on). 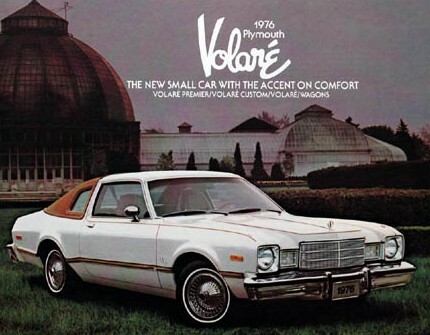 Volaré means “to fly” in Italian. Lyrics like “your love has given me wings” are especially fitting. The Italian: “Nel blu dipinto di blu” is the actual name of the song – meaning “In the sky, painted blue”. It would be great to have a blue-patterned Vivillon. Great song, … and every time I listen to Dean Martin I always get hungry for spaghetti. The memories are still vivid … but I digress. “Vivid Calores” could also be a name! A French language (Kalos) fitting name would be “Vichyssoise” – the potato and leeks soup which is served cold in those super-expensive French restaurants. No youngsters, I kid you not. A recipe is linked here. 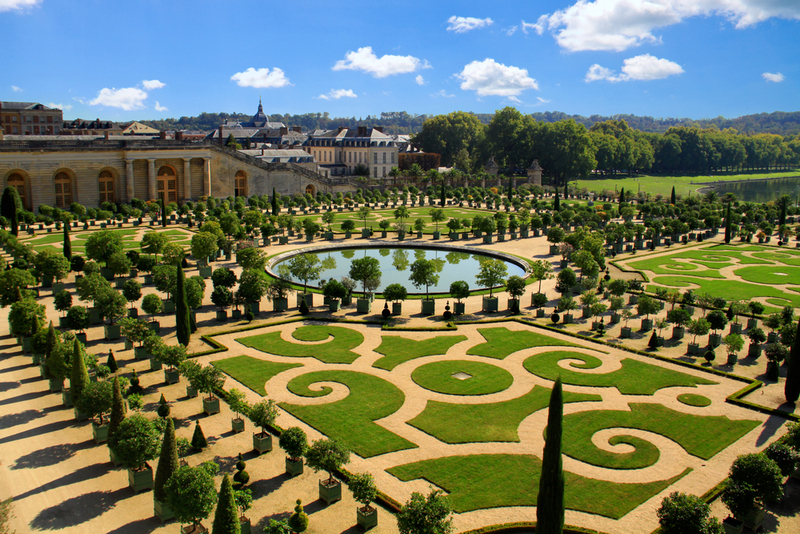 I have also used the name “Versailles” as in the Palace at Versailles (take the tour here). Of course, X & Y veterans are already familiar with the Kalos-region palace. I have also named them “Vermilion” after the brilliant red-color pigment originally made from the powdered mineral Cinnabar (another possible name). The color is widely used in Chinese art and lacquerware. In fact, the color is sometimes termed “Chinese Red” – which is another possible nickname! Notice how the artistic eye is drawn directly toward the Vermilion color of the garment. You might need a little more material for a kimono however. I used a Premier Ball to catch a female Vivillon, and named it “Kimono” because — well — I love kimonos, as you know. I think that the pattern would make a nice kimono. 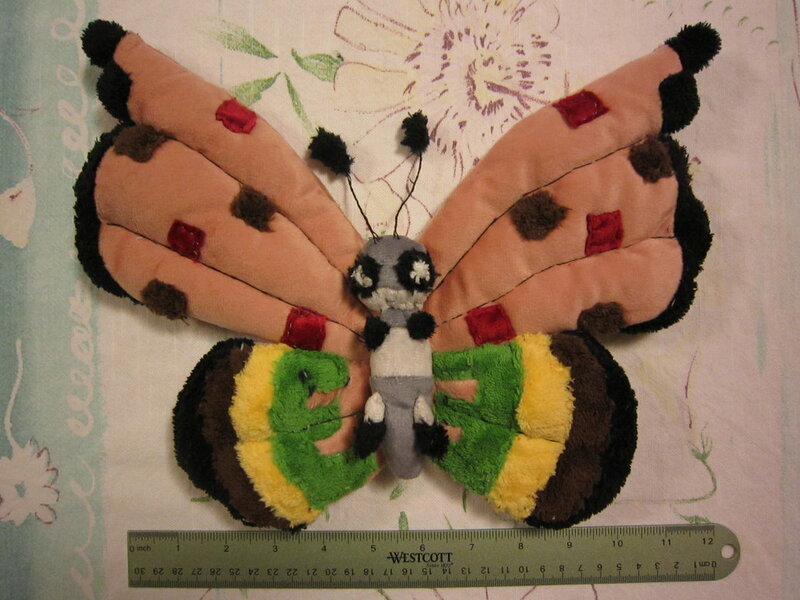 I have also named a male Vivillon “Vernon” after my friend in 6th grade, and also for “Mt. Vernon” home of George Washington. “Viva la __” might also be a good nickname. Alternateively: “VivaLes___” , etc. You can choose what is the blank, whatever you want to “Viva la” to with your last five letters. It is unfortunate that we cannot (as yet) re-name Pokémon, as you could name them in relation to what regional wing pattern they have. Vivillon’s pattern depends on the real-world geographic location set in the game where the Pokémon was caught. I received a High Plains Pattern Vivillon via the GTS, but some idiot named it “NO, SORRY”. 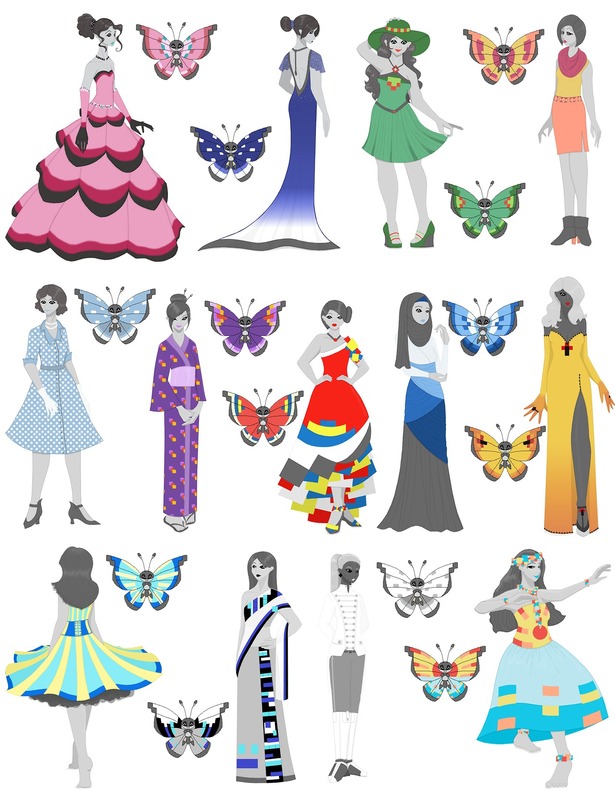 There 20 known patterns. It would be fun to collect and then name them something special! 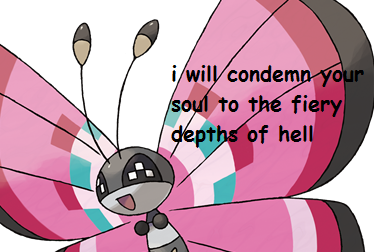 Poor Vivillon: The National Pokedex number for Vivillion is 666. Which may be off-putting for those of the Christian persuasion, as 666 is the number that represents “the Beast”. According to Christian mythology: during the latter days before the end of the world, Satan the Devil will send the anti-Christ to Earth in order to trick the gullible population into worshiping him, — after which he will destroy us all … (No … that is not Obama, you joker, …No! 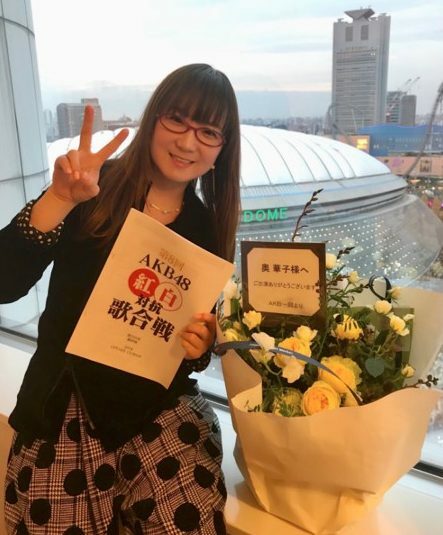 …oh, you…). If there are over 700 Pokémon, someone had to be #666, so at least it is this very special, and very appealing Pokémon. Foongus (Japanese: タマゲタケ Tamagetake) is a dual-type Grass/Poison Pokémon. It evolves into Amoonguss (Japanese: モロバレル Morobareru) and retains the Grass/Poison dual-type. The mushroom cap Pokemon Foongus is based on the word “fungus” and the larger mushroom Amoonguss is a play on the phrase “the fungus among us”. 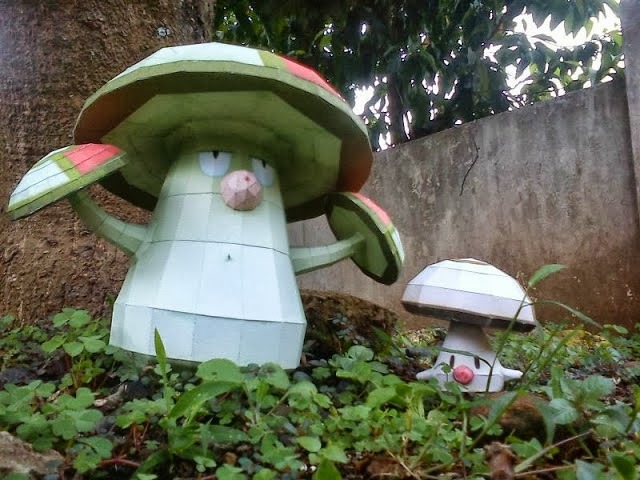 I do not like to train Pokemon where these fungi live. (I’m not a fun guy.) These Pokemon are usually just a status problem waiting to happen. Also, that Pokeball pattern cap would always fool me because I thought I have found an item in the field. Here are my nickname suggestions for these mushroom Pokemon. 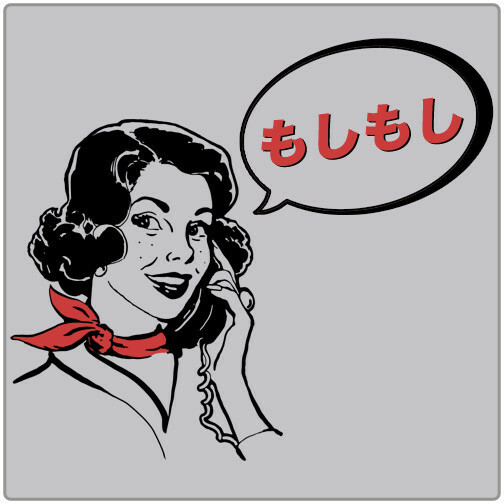 “Moshi Moshi” — This is a phrase for answering the telephone in Japanese (as seen above). 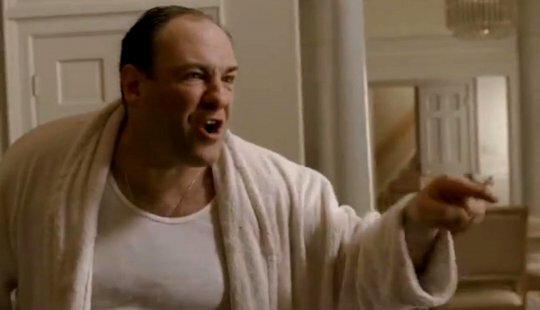 “Fungo” – as in to “hit a fungo” in baseball. 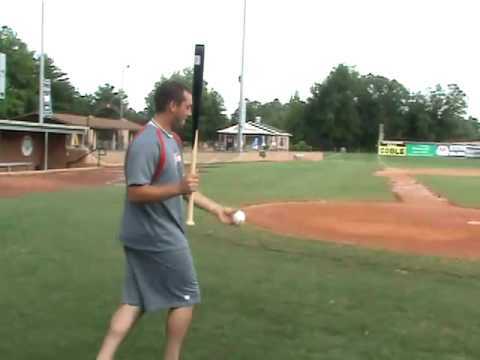 A fungo is a fly ball hit for practice fielding by a player who tosses a ball in the air and hits it as it comes down. A special, lighter “fungo bat” is used for practice. 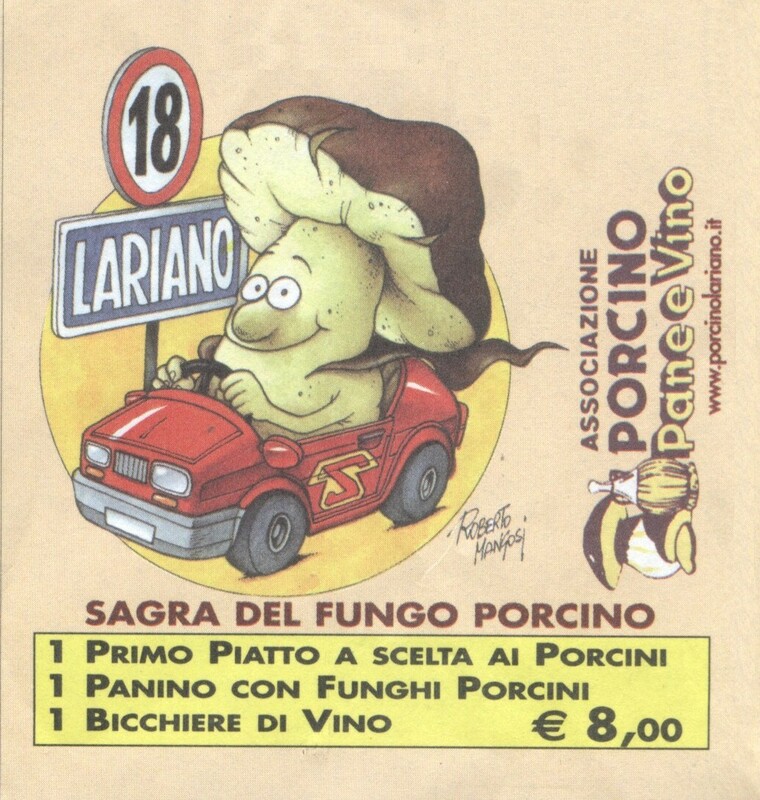 If you are Italian, fungo means mushroom. “MooGooGaiPan” — Thank goodness that in Kalos you can now use 12 letters! 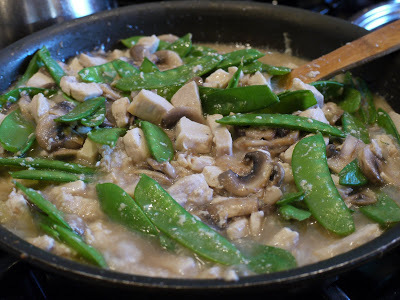 You can name your Pokemon after the wonderful Cantonese stir-fry dish with white chicken, mushrooms (moo-goo) and snow pea pods in a white sauce. … and that’s some gooooood fungus.